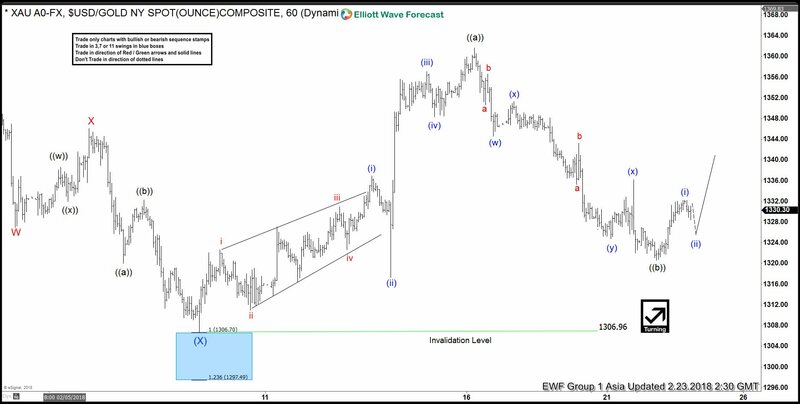 We revise our Gold Short Term Elliott Wave view to a more aggressive one and call the decline to 2.8.2018 at $1306.8 ending Intermediate wave (X). For this view to get validity however, the yellow metal needs to break above Intermediate wave (W) at $1366.06. Until then, the alternate view can’t be ruled out that the yellow metal can do a double correction in Intermediate wave (X) towards $1228.27 – $1302.28 before the rally resumes. 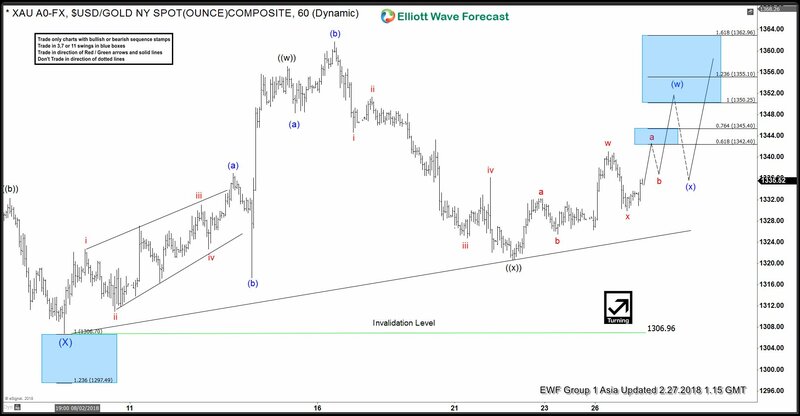 Up from $1306.8, the rally is proposed to be unfolding as a zigzag Elliott Wave structure where Minute wave ((a)) ended at $1361.72 and Minute wave ((b)) is proposed complete at $1320.60. Near term, while pullbacks stay above there, and more importantly above $1306.8, expect Gold to extend higher. We don’t like selling the yellow metal. If Gold breaks below $1306.8, then the yellow metal is doing a double correction in Intermediate wave (X) and opens extension lower towards $1228.27 – $1302.28 where buyers should appear for at least a 3 waves bounce. 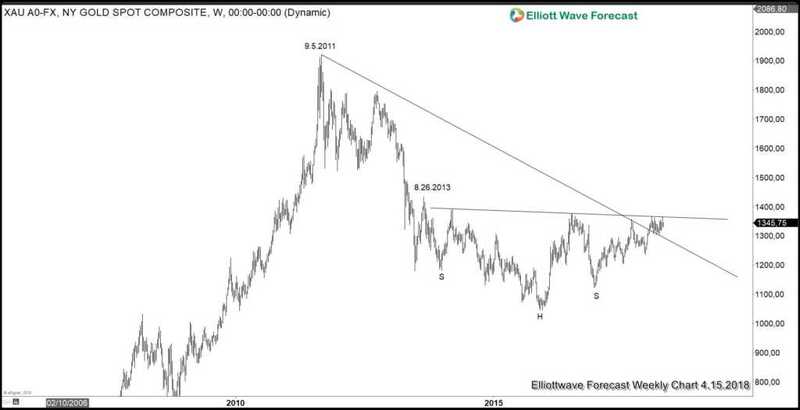 Short Term Elliott Wave view in Gold suggests the decline to $1306.8 ended Intermediate wave (X). However, the yellow metal needs to break above Intermediate wave (W) at $1366.06 to rule out the possibility of a double correction in wave (X). Up from $1306.8, the rally is proposed to be unfolding as a double three Elliott Wave structure where Minute wave (w))) ended at $1357.12 and Minute wave ((x)) is proposed complete at $1320.60. Near term, while pullbacks stay above there, and more importantly above $1306.8, expect the yellow metal to extend higher. We don’t like selling the yellow metal. If Gold breaks below $1306.8, then Intermediate wave (X) is unfolding as a double correction and opens extension lower towards $1228.27 – $1302.28 where buyers should appear for at least a 3 waves bounce. 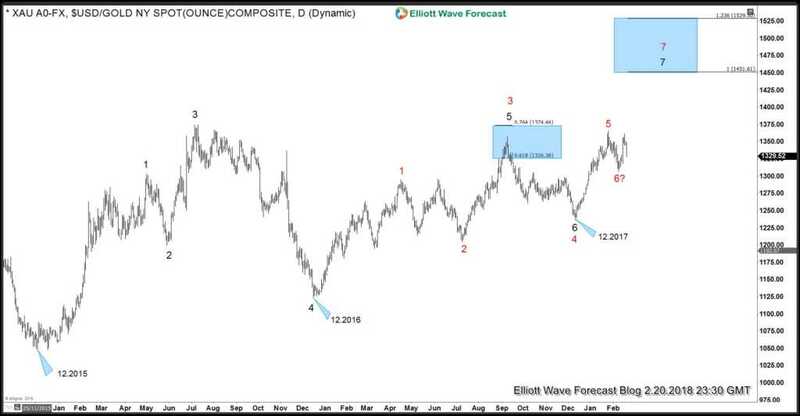 Revised Short Term Elliott Wave view in Gold suggests that the yellow metal is still correcting cycle from 12/13/2017 low ($1236.3) as a double three Elliott Wave structure. Up from 12/13/2017 low, Intermediate wave (W) ended at $1366.06 and Intermediate wave (X) pullback remains in progress as a double three. Down from $1366.06, Wave W of (X) ended at $1306.80 and wave X of (X) ended at $1357.12. Near term, while bounces stay below $1361.4, expect Gold to extend lower in wave Y of (X) towards $1288.1 – $1302.11 before the rally resumes. We don’t like selling the yellow metal and expect buyers to appear from the above area for at least a 3 waves bounce if not an extension to new high. 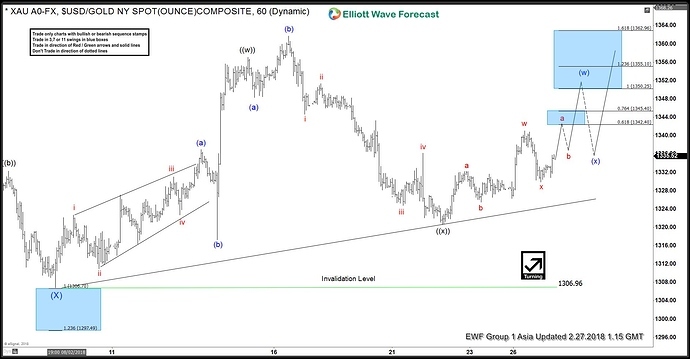 Gold short-term Elliott Wave view suggests that the rally to 4/11 high at 1365.24 ended Minor wave B. Below from there, the decline is unfolding as an impulse Elliott wave structure in Minor wave C of (B) lower. 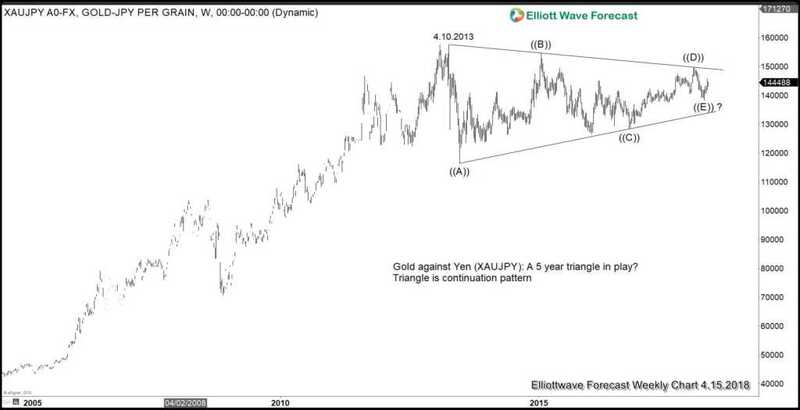 This structure forms a bigger FLAT Elliott Wave structure which starts from 1/25 peak. Internals of each leg to the downside, i.e. wave ((i)), ((iii)), and ((v)), shows a 5 waves structure subdivision in the lesser degree with extension in the third wave. Down from 1365.24 high, Minute wave ((i)) of C ended in 5 waves at 1332.78. 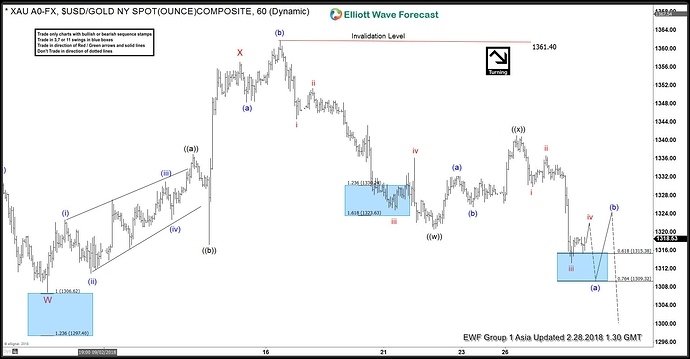 Minute wave ((ii)) of C ended as a Zigzag Elliott Wave structure at 1356.24. Minute wave ((iii)) of C ended in another 5 waves structure at 1301.5 low. 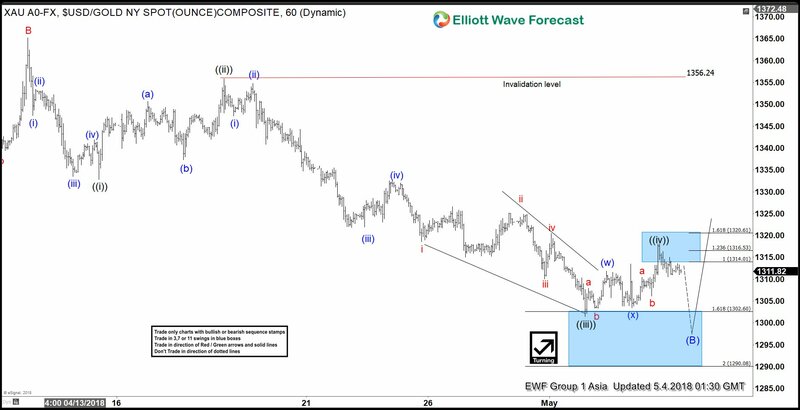 Above from there, the bounce in Minute wave ((iv)) of C appears complete as a double three Elliott Wave structure at yesterday’s high at 1318.1. However, a break below 1301.5 low remains to be seen to confirm the next leg lower in Minute wave ((iv)) of C bounce. Until then, a double correction higher in Minute wave ((iv)) bounce can’t be ruled out. The entire FLAT structure from 1/25 peak has reached 100% target at 1302.1, thus the cycle is mature and Intermediate (B) could end any moment. However, near-term, while bounces fail below 1318.1 high and more importantly the pivot from 1356.24 high stays intact, gold has scope to see another push lower. Potential target for Minute wave ((v)) of C, if it happens, comes at 1295.55 – 1297.92 which is the 1.236%-1.382% inverse Fibonacci extension of a Minute wave ((iv)). Afterwards, the metal is expected to resume the upside or should produce a bounce in 3 swings at least. We don’t like selling it. We at Elliottwave-Forecast look at the Market as a whole and we keep track of many instrument to get an edge in the Market. At the end, nobody is 100% correct, but having an edge is the key for traders to help plan their upcoming trades. 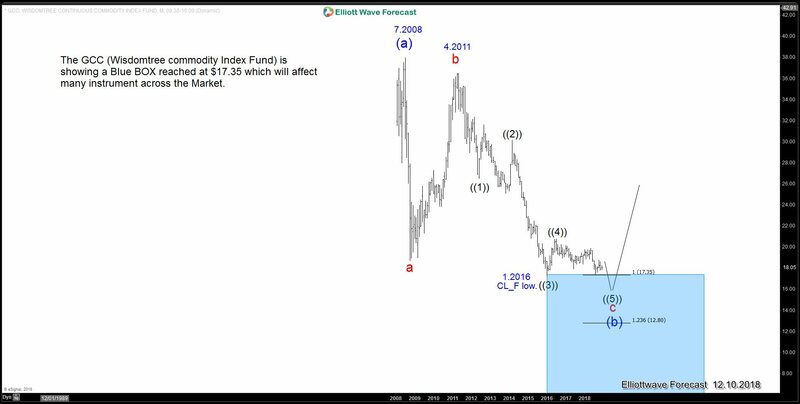 In this article, we look at the GCC (Wisdomtree Commodity Index Fund) which is showing a zig-zag structure within the Super cycle degree down from 7.2008 peak and it has reached the Blue box buying area which starts from 17.35. This structure and extension within the Blue Box will affect many instrument across the Market including $CL_F (OIL), $XAUUSD (GOLD), $XAGUSD (SILVER), $SPX and also $DXY. Chart above shows correction ending in the blue box and rally resuming for new highs above July 2008 peak which is the most aggressive view. There are alternative views and one of them is a bounce in a wave ((4)) when we are currently ending wave ((3)) and another low in wave ((5)) to complete wave c red. Either way, when we relate this to $USDCAD, it is easy to time a turn when the pair reaches its own Blue Box which will create either a strong rally in GCC and a strong sell off in $USDCAD or a bounce in wave ((4) and a 3 waves pull back in $USDCAD. In either case, a reaction higher should take place soon in GCC.